With so many junior players signing NHL contracts, it makes you wonder when, or if, Evan Bloodoff will be signed by the Phoenix Coyotes. The Coyotes, who could possibly move to Winnipeg at seasons end, drafted the now 20 year-old in the 6th round of the 2009 NHL draft. The Coyotes have until June 1st to sign him or the pride of Castlegar becomes a free agent. It isn't often that an opposing WHL radio play-by-play broadcaster has a chance to spend a significant amount of time in one city getting to know the organization and the fans that support their team. Everyone assumes it is a bitter rivalry that extends far beyond what happens on the ice and that the visiting broadcaster is part of the 'evil empire'. But let me say what a pleasure it was to meet and talk with so many Hawks fans over my two visits to Portland during the series. I met so many of you and realized the passion and love you have for your team. I also have a greater appreciation for the American hockey fan then ever before. You showed a great appreciation for the work I do and were not afraid to literally come up to my broadcast booth and introduce yourself. I was taken aback by that kindness because I am in an industry where you hear more about the bad things you do and are criticised for it. It is in these relationships, while trivial in the eyes of some, that make my job worth while. I don't think in the 16 years of calling games in this league have I ever had as much interaction with opposing fans like I did over the last ten days with the Hawks faithful. This blog entry was prompted by a Facebook message I received earlier today from an individual who I met prior to the start of game five in Portland. I won't mention names as the message was likely intended for my eyes only, but I was flattered at what the simple conversation and introduction meant to this person. Much like that encounter, the kindness you showed towards me doesn't go unnoticed. I have the platform on this blog to express myself and won't hesitate to thank you. Many of you stopped by this blog during the series and expressed your opinion and I appreciate the time you took to visit my little space in cyberspace. For the record, my favourite fans outside of Kelowna now reside in the 'City of Roses'. Craig Cunningham finally left Prospera Place after a playoff series with a smile on his face. The Portland Winterhawks forward, who was a part of a Vancouver Giants team that lost a heart breaker in the 2009 Western Conference final against the Rockets, scored the game winning goal last night leading the Hawks to a 4-2 win. The Hawks eliminate the Rockets in six games and advance to the Western Conference final. The Rockets season is now over after 82 games. While the final score read 4-2, this was a one goal game until Hawks defenceman Joe Morrow scored into an empty net with three seconds remaining in regulation time. The Hawks built up a 3-0 lead, yet the Rockets pulled out all the stops with goals from Geordie Wudrick and Brett Bulmer to make the visitors sweat. In the end though, depth and skill prevailed. The Hawks are a good team and are built for a long playoff run. They were suppose to win. For the Rockets, to be essentially within a goal of sending the series to a game seven is pretty incredible. The series loss on home ice is rare. The last time the Rockets season came to an end at Prospera Place was April 27/2004 in a 2-1 overtime setback to Everett. That series went to a game seven. Geordie Wudrick's career came to an end where it started. Wudrick played 400 WHL games, which includes the regular season and the playoffs. The 21 year-old's first ever game was at Prospera Place as a member of the Swift Current Broncos. We also said goodbye to the junior careers of defenceman Zak Stebner and Evan Bloodoff. Stebner played with six teams over his career and you could tell in his voice on our post game show that it was an emotional time for him when the final buzzer sounded. I love that emotion because it really tells the listeners that these players care and wanted to win. Bloodoff admitted after the game that it hadn't sunk in that his time in Kelowna was over. Bloodoff was a five year player with the Rockets and is one of only nine to accomplish that feat. Tyson Barrie and Mitchell Callahan also say goodbye. While both players are 19, they have signed contracts with Colorado and Detroit respectively. More thoughts on those two players in a later post. Two Hawks impressed me in this series, and no, neither are a top end forward. Goaltender Mac Carruth was suppose to be the weak link in this series, yet the Hawks goaltender really came to play. He honestly surprised me at how good he was. Maybe he will get the Kelly Guard treatment because he plays behind such a good team? Guard put up big numbers in 2004 but played in front of a solid defensive core, and outside of Kelowna, may have never received the praise and respect that he deserved. The other Hawk that showed me something was Taylor Jordan. The tallest player on the ice used to be one dimensional. The big man showed in this series that he can take a regular shift and can do some good work on the penalty killing unit. It is always neat to see a player transform and improve his game. The one sour note from last night's game was the ending when Hawks forward Brad Ross used a golfing gesture with his stick towards the Rockets. It may sound comical to some, but I would be embarrassed if a Rockets player did the same. Winning with class and respect for your opponent is what 19 of the 20 players on the Hawks roster did. Too bad Ross can't follow the lead of the Johansen's and Niederreiter's. I will give him the benefit of the doubt that he too will learn to be gracious when it is all said and done.Stir the pot during the game but show you are above that when the buzzer sounds. The road team won five of the six games in this series. The Rockets failed to win three games on home ice while the Hawks were victims to two setbacks at the Rose Garden. I want to congratulate the Hawks organization for winning the series. It was a lot of fun. The Hawks players I spoke to in this series were excellent. I have a better appreciation of Johansen, Cunningham and Niederreiter after short interviews. All three are well spoken and are great ambassadors of the team. Coach Mike Johnston and I met up a couple of times for some good conversations. I wish all the best to this skilled team and look forward to the Western Conference final against either Spokane or Tri City. Fifteen year-old Madison Bowey made his playoff debut against the Hawks. The Rockets second round bantam pick saw limited ice time. I will say that this series against the Hawks was a great learning experience for the Rockets younger players. I hope you enjoyed the one hour post game show following the game. Thanks to Gord McGarva, we had interviews with all three 20 year-old's along with comments from Tyson Barrie, Mitchell Callahan and Adam Brown. We even had Hawks play-by-play man Andy Kemper on for a couple of quick minutes after the game concluded. Thanks to all talk radio, we have the freedom to give the Rockets the air time they deserve after a long season. Hawks eliminate Rockets with 4-2 win. Tonight’s Preview: The Kelowna Rockets and Portland Winterhawks are meeting in game six of their best of seven Western Conference semi final series. The Hawks lead the series three games to two. The road team has won four of the five games in this series. The Hawks won games two, three and four while the Rockets have wins in game one and five. In the last game, Friday night in Portland, Jessey Astles scored in overtime lifting the Rockets to a 2-1 win. Adam Brown was the first star making several sensational saves. If a game seven is necessary it will be played Tuesday at the Rose Garden in Portland. The Rockets are coming off a four game sweep of Prince George in round one. The Rockets out-scored the Cougars 22-13 and averaged 4.4 goals per game. The first five games in numbers: The Hawks have out-shot the Rockets 229-170 in the first five games, including 92-59 in the second period…The Rockets are 5 for 27 in the series on the power play (18.5%) while the Hawks are 7 for 22 (31.8%) with the extra man….The Rockets have opened the scoring in three of the first five games and have led or have been tied after the opening period in four of the five games. By the numbers: The Rockets are now 11 for 48 (22.9%) on the power play in this year’s playoffs. The Rockets have out-scored the opposition 17-7 in the third period in this year’s post season….Shane McColgan has a point in all nine playoff games. McColgan has 8+10=18 in those nine games…Tyson Barrie has a point in seven of nine playoff games. Barrie has 2+8=10. Zak Stebner’s assist was his first point in four playoff games. Adam Brown has a save percentage of .926 in this series and has made 212 of 229 saves in the five games. The Hawks have averaged 45.8 shots on goal in the five games. Brown has a better save percentage in this series than he did in round one. Playoff Experience: Geordie Wudrick and Tyson Barrie lead the Rockets in playoff experience with 50 games apiece. Evan Bloodoff has 46 games under his belt.Overage d-man Zak Stebner has 36 games of playoff experience after playing in 23 games last season with the WHL champion Calgary Hitmen. This and That: Colton Jobke has been suspended for one game after receiving a five minute major and game misconduct Friday night after a hit on Hawks forward Brad Ross. The Rockets have called up 15 year-old Madison Bowey. Bowey was the Rockets 2nd round pick (1st pick in the 2nd round) in last summer’s bantam draft….The Rockets defensive core is a combined +3 in this series. Kevin Smith and MacKenzie Johnston lead the way at +3….Tyson Barrie has 1+4=5 in this series…Shane McColgan has eight goals in his last seven games….Mitchell Callahan has two points (one goal and one assists) in the first five games of the series….Zach Franko has missed the last four games after suffering a broken nose after a hit by Hawks forward Brad Ross in game one. Ross was suspended for three games by the WHL for the hit. Ross returned in game five...Shane McColgan became the first Rockets player to score three goals in a playoff game since Blake Comeau scored three times against the Kootenay Ice in 2004. McColgan scored three goals in a game one 5-1 victory…The Rockets are involved in the second round of the playoffs for a third straight season….The Rockets had 16 fewer points than the Hawks during the regular season….Jason Siebert is missing his 57th straight game after undergoing surgery on his wrist….The Rockets allowed the fewest goals against on the road in the WHL this season (93 – tied with Red Deer)….The Rockets were involved in twenty-six (26) one goal games this season. The Rockets were 18-7-0-1 in those twenty-six (26) one goal games…Only three players dressed in all 72 regular season games this season. They were Zach Franko, Kevin Smith and Evan Bloodoff.…The Rockets received the second most power play chances of any team in the WHL this season (383). Tri City led the league with 385 opportunities…The Rockets have not lost in overtime this season. They were 6-0 in the regular season and 1-0 in the playoffs….The Rockets allowed the second (tied with Red Deer) fewest power play goals against in the WHL (51). Only Spokane allowed fewer goals against…The Rockets allowed 26 fewer goals against than Portland…Nineteen year-old Max Adolph is missing his 24th straight game after suffering a concussion February 16th…NHL Central Scouting has released the list of the top North American players eligible for the upcoming draft. Zach Franko is rated 123rd while Shane McColgan is ranked 125th. Jessey Astles is rated 160th…Ryan Huska is coaching in his 51st career WHL playoff game tonight. Huska is 30 and 20 as a coach in the playoffs. Huska has been to a game seven twice as a coach. Last season his team beat Everett in a seventh game in round one and in the 2008 playoffs the Rockets lost in seven games to Seattle…The Rockets overtime win on the road Friday night in Portland was the first extra time playoff win on opposition ice since 2009, when Cody Almond scored in overtime in a game three victory in Kamloops (3-2) in round one. One of the quietest personalities on the Kelowna Rockets roster made the most noise Friday night. Seventeen year-old Jessey Astles scored the biggest goal of his career, a laser beam like snap shot over Hawks goaltender Mac Carruth's blocker side, in a 2-1 overtime win. Astles' goal came about seven minutes into the first overtime when he intercepted a Derrick Pouliot cross ice pass at the Rockets blue line and went in on the breakaway. It was Astles third goal of the playoffs and second breakaway goal in the series. Astles scored just three goals during the regular season. Any questions on why Adam Brown was named the Rockets MVP? Didn't think so. Brown played the best game of the series Friday night. If you think he was good in game one, he was even better in game five. Brown was spectacular in the second period when the Hawks managed just one goal on 21 shots. No question he was the games number one star. Someone give this guy a NHL tryout or offer him a contract! Rockets d-man Colton Jobke is handed a five minute major and game misconduct for boarding after hitting Hawks forward Brad Ross into the side boards. The Hawks then had the luxury of a 5 on 3 after Rockets d-man Kevin Smith fired the puck over the glass. While the Hawks kept the puck in the Rockets zone in an attempt to open the scoring, few quality shots were taken on that extended power play. This game had it all including a big hit when Evan Bloodoff ran into Hawks forward Ryan Johansen at the Portand blue line. Johansen received a pass and was decked by Bloodoff. The clean hit saw Johansen's helmet pop off his head. Surprisingly the 18 year-old stayed in the game but just didn't seem to be his dynamic self after it. What impressed me about the Hawks after the hit was no one engaged Bloodoff in a fight. It is common place in today's game where a player can't make a solid open ice hit without getting into a scrap. It was nice to see that after the hit happened, both players went their merry way. The officiating job by Andy Thiessen and Nathan Wieler was outstanding. This was WHL officiating at its finest. Well done gentleman. No, they don't read this blog but that doesn't mean I won't mention them and the excellent job they did. Putting the whistle away in the third period and letting the two teams play was the right decision. Awesome. Did you notice the "tweedy bird" flying around the arena during the game? It would often perch itself on the bottom of the score clock. Did anyone get pooped on? Maybe Sylvester finally caught it because I didn't see it in the third period. I can't say enough about the Hawks fans I've met in this series. Friday night a group of people came to the broadcast location during the intermission and had such nice things to say about our broadcast. They even presented me with a 'Hoser' golf towel. The "Hoser's", from what I've been told, are a group of fans that have been sitting with each other in the same section at Hawks home games for years. Members of the Hawks Booster Club have won me over in this series. I walk by their table in the concourse area of the arena and we trade friendly smack about our respective teams. This booster club presents every Hawks player at seasons end with a huge white binder that includes everything from photo's, articles to game sheets over the entire season. They even presented me with a Portland Winterhawks Booster Club pin before the game. These people are class acts all the way and the team should be proud of their good work. I received a visit from Dan Folwick before the game. Folwick is former public address announcer of the Hawks who would bellow out: "Here comes the Hawks" as they entered the ice. Man, I love that. It was nice to touch base with him and it appears that life is treating him well. See you at Prospera Sunday afternoon (5 p.m) for game six. Bring your vocal cords and make some noise. After a day off, I hope to be well tuned as well! It's a rainy day in Portland, but that hasn't dampened the spirits of the Kelowna Rockets heading into game five of their playoff series with the Hawks. The Rockets have dropped the last three games but two of those three could have gone either way. Again, it comes down to eliminating mistakes and scoring on key chances. It's just the way it is. I love Kevin Constantine's comment to the media when he was the head coach of the San Jose Sharks years ago. The quote that stands out is, "will beats skill". How true that is. If the Rockets want to win game five bad enough, more than the Hawks do, they can send this series back to Kelowna for game six on Sunday. All 18 skaters must play a factor in the game. In the playoffs, despite what some would believe because of some great individual efforts by the Hawks, it's teams that succeed in the post season not one or two players carrying the bulk of the load. Being down three games to one in a playoff series is never a good position to be in. But in saying that, ask the Calgary Hitmen how they got out of a similar situation in 2010. In an opening round series against Moose Jaw, the Hitmen found themselves in a huge hole. Yet, the Hitmen found a way to work themselves out of that predicament and eventually won the series in seven games. So to say it can't be done would be foolish. But to look at the big picture of winning three straight games against a quality team like Portland is daunting. So let's all say it together...."you have to take it one game at a time". A big, and I mean big crowd is expected at the Rose Garden tonight. Perfect! A big crowd means a tremendous atmosphere in the building. It should be rock'n. In my opinion this plays into the Rockets hands as much as it does the Hawks. The Rockets players love playing in the Rose Garden and the big crowd doesn't intimidate, it only motivates them. Hawks forward Brad Ross is back in the lineup tonight after serving a three game suspension for a hit on Rockets forward Zach Franko in game one. Franko suffered a broken nose and likely a concussion in the hit. Franko won't play tonight, and if the truth be known, he didn't even make the trip down to Portland. I've been told league disciplinarian Richard Doerksen will be at the game tonight in Portland. I will try to track him down for an interview in one of our intermissions. The Portland Winterhawks are anything but a one trick pony. 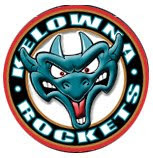 Oh ya, they can beat you with their high octane offense, but in game four last night at Prospera Place, the Western Conference regular season champions used a smothering defensive game in a 4-2 win over the Kelowna Rockets. The Hawks allowed just 13 shots on goal in the final 40 minutes and now have a 3-1 lead in the best of seven series with game five set for Friday in Portland. For the second straight game the Hawks opened the scoring. On a two-on-one, Ty Rattie's attempted back hand pass hits Rockets goaltender Adam Brown and somehow makes its way over the goal line. It's a soft goal that you just can't give up against a team that can create golden scoring chances on their own. The gift gives the visitors a 1-0 lead before they strike again just 21 seconds later. It looks like a long night as the 47 hundred fans are stunned. You have to give the Rockets credit for battling back though. Shane McColgan, who has clearly been Kelowna's best player, scores a huge power play goal late in the first period and the Rockets trail by just one goal. But again, the elusive goal to tie the game was extremely hard to find as the Hawks seemed to dig in their heels by playing a structured defensive game. The Hawks get into penalty trouble late in the second period but the Rockets power play fails to capitalize. In my opinion that was the turning point in the game. Instead of the Rockets scoring to tie the game, Hawks d-man Joe Morrow scores from a point shot from the blue line just 2 and a half minutes into the final frame and it's a 3-1 game. I am not sure if both teams were tired, but after Morrow scored to make it 3-1, the Rockets had little push back. Finally with four minutes left, Brett Bulmer scored and it looked like we were in for a good finish. But with the Rockets pressing and using defenceman Tyson Barrie as a forward in an attempt to find the equalizing goal, Ryan Johansen was sent in on a clear cut breakaway and beat Brown between the legs for his 7th point of the series. Finally some solid officiating! Referee's Sean Raphael and Trevor Hanson were gold. The Rockets had four power plays while the Hawks had three chances. Both officials used good communication skills and didn't rule with an iron fist. 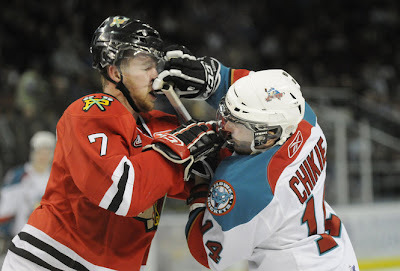 The game featured a third period fight between Rockets forward Mitchell Chapman and Hawks enforcer Taylor Jordan. Jordan came to the aid of a teammate after Chapman initiated a solid hit. Chapman did surprisingly well against a much bigger Jordan. Some may remember Jordan tangling with Ryley Grantham in his rookie season and doing very well. I sure liked the play of Rockets forward Jessey Astles. 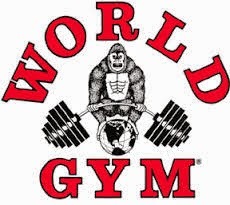 Astles, Colton Heffley and Mitchell Chapman ate up some huge minutes and made life miserable with their physical play. The physical play all started with two solid hits from 20 year-old d-man Zak Stebner who played his best game of the series. After being somewhat quiet in the first three games, Hawks forward Brendan Leipsic really came to play in game four. The smallish forward created some really good scoring chances with his speed. It was nice to 'break bread' with Hawks radio broadcasters Todd Vrooman and John Kirby after the game. Those two stayed the night in Kelowna while play-by-play man Andy Kemper traveled with the team to Chilliwack where they spent the night in the lower mainland before traveling back to Portland. It is the first time I have spent some quality time with Kirby. You can really tell he has a passion for what he does and is a solid piece of the puzzle on the Hawks broadcast. How odd is it that Kirby has been a part of the Hawks broadcasts in some way for over 30 years, yet I don't officially meet him until this series. What a shame. Congrats to Rockets goaltending coach Kim Dillabaugh, who is now the father to a baby girl. Ellie Amelia Dillabaugh, weighing 8 pounds and 4 ounces, was born April 13th at 1:17 am. A Portland Winterhawks fan told me before game one that the weak link for the Western Conference regular season champions was in goal. I could have bought into that theory after game one following a 5-1 Rockets win, but I wasn't buying what he was selling after what I witnessed in game three. Portland's Mac Carruth made several solid stops in the Hawks 5-4 win Tuesday night over the Kelowna Rockets. Carruth allowed four goals in the win, but timely saves as the game wore on, including a nice glove hand save on Rockets forward Geordie Wudrick after a clean face-off win by Mitchell Callahan with time winding down, was a game saver. Both Carruth and Adam Brown's goals against average are going to take a beating in this series because both teams do so many good things in the attacking zone. It's those timely saves that make the difference between winning and losing. Nino Niederreiter scored twice in the win, but I thought Ryan Johansen was the real reason behind the 18 year-old's success. Johansen is dangerous with the puck and you don't know whether he is going to shoot or dish the puck off. Johansen had three assists and was full marks for the games first star. The Hawks opened the scoring for the first time in the series, but the Rockets did a good job of battling back. As the script has been written so far in this series, the Rockets were probably the better team through 20 minutes and had a 2-1 lead. But as we follow the script, the Hawks used a solid second period to take a 4-3 lead into the final frame. Hawks d-man Tyler Wotherspoon scored a late second period goal just 40 seconds after Rockets forward Brett Bulmer tied it at 3, allowing the Hawks to enter the intermission with a slim one goal lead. Wotherspoon scored just two goals during the regular season. The Hawks ended the night going 3 for 10 on the power play. Suspect calls, or in some cases non-calls were a constant throughout the game. The Rockets had seven power play chances of their own, yet it yielded just one goal. Seventeen power play chances combined made for a lot of whistles and at times choppy play. The second period in particular took forever. Shane McColgan was given a ten minute misconduct midway through the third period after he was sent to the penalty box for hooking. I have no problem with the hooking minor, but he banged his stick against the glass in the penalty box and was given an additional 10 minutes to cool his heels. Essentially the Rockets lost their top scorer for the final half of the third period. I have seen players hit the glass in the penalty box with their stick in frustration before and get no additional penalty. On this night, with less than stellar officiating from either Derek Zalaski or Colby Smith, maybe McColgan should have expected that a 10 minute misconduct would be handed his way if he even in the least bit stepped out of line? Outside of the loss, the most disappointing aspect of the one goal loss was the attendance. Just over 48 hundred fans watched game three. That left close to 12 hundred seats empty in a building that is sold out during the regular season. I hear people time and time again bitching for hockey tickets during the regular season but they can't get any. Where are they now? While it means little on the scoreboard, the Rockets out-shot the Hawks for the first time in the series. If you can generate close to 40 shots on goal against the Hawks, you are doing some darn good things in the offensive zone. 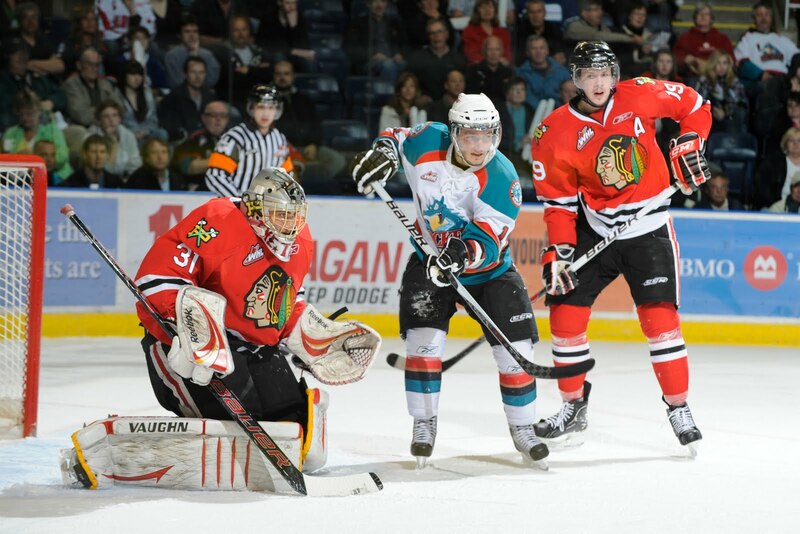 Tonight’s Preview: The Kelowna Rockets and Portland Winterhawks are meeting in game three of their best of seven Western Conference semi final series. The Rockets were a 5-1 winner in game one Thursday night before the Hawks were a 6-3 winner in game two on Sunday. These two teams met just four times this season, with the Hawks out-scoring the Rockets 18-9. The Rockets lost the first three meetings by scores of 4-2, 6-1 and 5-1 before winning 5-3 back on January 14th. The next two games in this series are in Kelowna tonight and tomorrow before game five is played back in Portland on Friday. The Rockets are coming off a four game sweep of Prince George in round one. The Rockets out-scored the Cougars 22-13 and averaged 4.4 goals per game. The first two games in numbers: The Hawks have out-shot the Rockets 98-64 in the first two games, including 41-20 in the second period…The Rockets are 2 for 11 in the series on the power play (18.2%) while the Hawks are 2 for 6 (33.3%) with the extra man….The Rockets have opened the scoring in the first two games and have led after the opening period in both outings. By the numbers: The Rockets are now 8 for 32 (25%) on the power play in this year’s playoffs. The Rockets have out-scored the opposition 15-4 in the third period in this year’s post season….Shane McColgan has a point in all six playoff games. 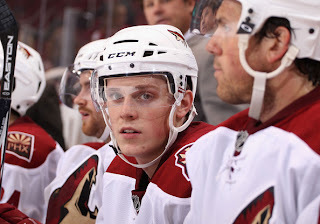 McColgan has 7+8=15 in those five games…Tyson Barrie has a point in all six playoff games. Barrie has 1+7=8. Playoff Experience: Geordie Wudrick and Tyson Barrie lead the Rockets in playoff experience with 47 games apiece. Evan Bloodoff has 43 games under his belt.Overage d-man Zak Stebner has 33 games of playoff experience after playing in 23 games last season with the WHL champion Calgary Hitmen. This and That: The Rockets are 1-0 in game three situations in this year’s playoffs. The Rockets beat the Prince George Cougars 7-6 in game three of an opening round series…The Rockets were a 5-3 winner in game three of their opening round playoff series last season against Everett as well….Shane McColgan has scored in four straight playoff games. McColgan has seven goals in those four games…Geordie Wudrick has not scored in four straight playoff games…Zak Stebner has three goals in six playoff games….Zach Franko missed game two after suffering a broken nose after a hit by Hawks forward Brad Ross in game one. Ross was suspended for three games by the WHL for the hit. Ross returns to the lineup Friday in game five….Shane McColgan became the first Rockets player to score three goals in a playoff games since Blake Comeau scored three times in a playoff game against the Kootenay Ice in 2004. McColgan scored three times in a game one 5-1 victory…The Rockets are involved in the second round of the playoffs for a third straight season….The Rockets had 16 fewer points than the Hawks during the regular season….Jason Siebert is missing his 54th straight game after undergoing surgery on his wrist….The Rockets allowed the fewest goals against on the road in the WHL this season (93 – tied with Red Deer)….The Rockets were involved in twenty-six (26) one goal games this season. The Rockets were 18-7-0-1 in those twenty-six (26) one goal games…Only three players dressed in all 72 regular season games this season. They were Zach Franko, Kevin Smith and Evan Bloodoff.…The Rockets received the second most power play chances of any team in the WHL this season (383). 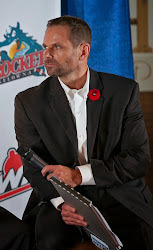 Tri City led the league with 385 opportunities.…The Rockets (6-0), Portland (5-0) and Swift Current (5-0) were the only three teams in the WHL this season that did not lose in overtime….The Rockets allowed the second (tied with Red Deer) fewest power play goals against in the WHL (51). Only Spokane allowed fewer goals against…The Hawks scored 63 more goals than the Rockets this season…The Rockets allowed 26 fewer goals against than Portland…Nineteen year-old Max Adolph is missing his 21st straight game after suffering a concussion February 16th…Geordie Wudrick turned 21 on Saturday…NHL Central Scouting has released the list of the top North American players eligible for the upcoming draft. Zach Franko is rated 123rd while Shane McColgan is ranked 125th. Jessey Astles is rated 160th…Ryan Huska is coaching in his 48th career WHL playoff game tonight. Huska is 29 and 18 as a coach in the playoffs. Huska has been to a game seven twice as a coach. Last season his team beat Everett in a seventh game in round one and in the 2008 playoffs the Rockets lost in seven games to Seattle. Hawks father caught between rock and hard place! Rockets get their slingshot ready!